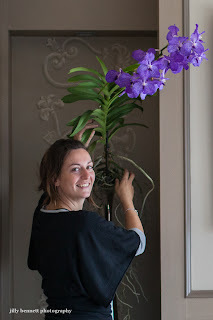 Readers of Menton Daily Photo have already met the beautiful Perrine as I showed photographs of her creating amazing hats made of flowers in her Menton atelier. Perrine's company is called Miss Rose by Perrine. Perrine is Monaco's most favourite florist. 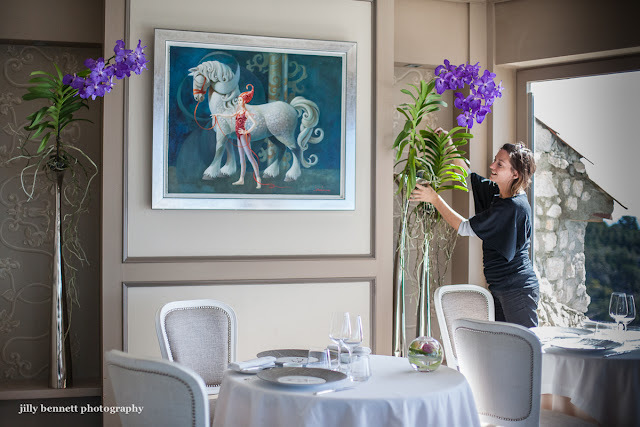 She creates stunning flower arrangements at many hotels and restaurants, weddings, model shoots, etc. Here she is at the Chèvre d'Or in Eze. When I tell you it was Perrine who made HSH Princess Charlene's bridal bouquet when she married HSH Prince Albert II, you'll know the esteem in which she is held in the Principality and beyond. Tomorrow: we meet the chef concierge, Antonio. This picture looks like a painting! We ate outdoors when we were there, so we missed the flowers. Thanks for showing us what me missed. Café de Paris - Coffee?